The first step in the database rollover process is designed to allow you to begin enrolling campers and hiring staff for next year, while the current year is still in progress. 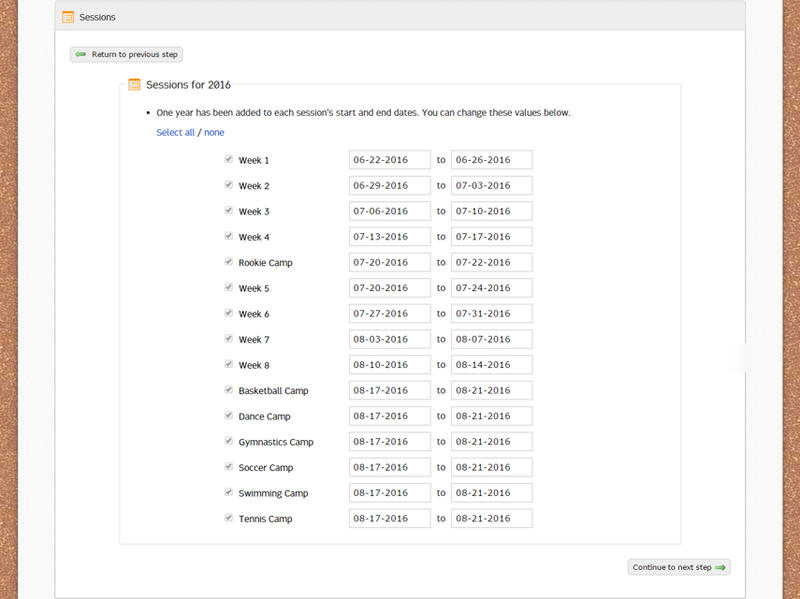 Once your current camp season is complete, you’ll move on to Step 2 of the database rollover. 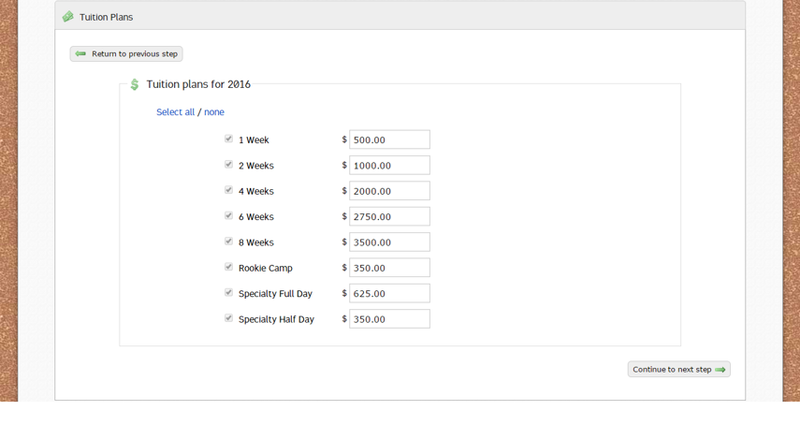 To begin enrolling campers and hiring staff for next year, select Step 1: Begin enrolling / hiring for 2016 in the Rollover Wizard section under the DB Management tab of the Admin menu. Your current year will not be changed and you will be able to enroll campers for 2015 and 2016 until you complete Step 2. You may select to copy any of your 2015 enrollment options to 2016. Any items associated with these options, including sessions, tuition plans and enrollment extras, will be automatically selected to be copied. By default, enrollment questions will be selected to copy to 2016. You may un-check this option if you do not want to copy the questions to the following year. By default, all sessions from the current year will be checked off to copy to the following year, with one year added to the session's start and end dates. Sessions cannot be unchecked if they are included in an enrollment option that is being copied. You may update these dates now, or on the Sessions step of the CampSite Setup Wizard. By default, all tuition plans from the current year will be checked off to copy to the following year. You can un-check any tuition plans you that are not currently used in the enrollment options being copied. Tuition rates can be adjusted here as well. By default, all payment schedules from the current year will be checked off to copy to the following year, with one year added to each of the payment schedule's invoice dates. 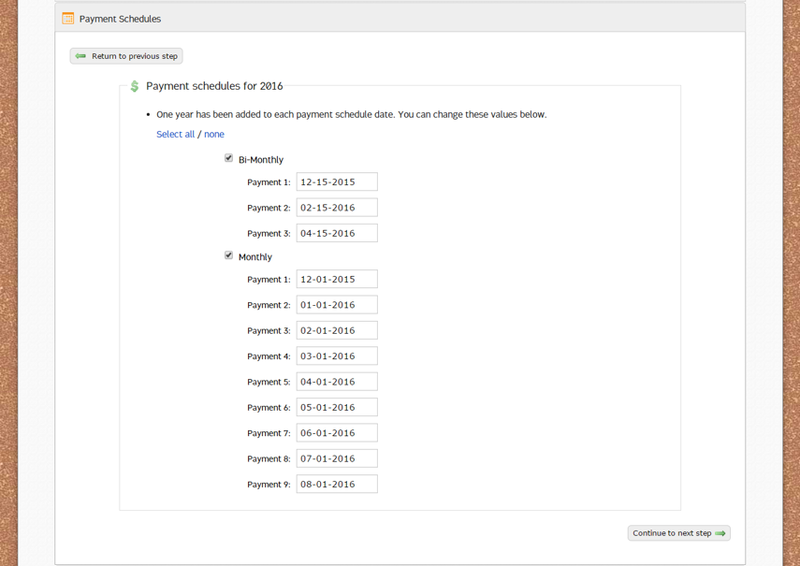 You can un-check any payment schedule you do not wish to copy, and click on any invoice date to make changes. You may choose to copy any yearly enrollment extras used in 2016 to 2016. On the next step, you'll be able to adjust the price. By default, all enrollment extras will be checked off to copy to the following year. You can un-check any enrollment extras you do not wish to copy if they are not being used in the Enrollment Options being copied, or copied as a Yearly Enrollment Extra in the previous step. Enrollment extra rates can be adjusted here as well. By default, all enrollment discounts will be checked off to copy to the following year. You can un-check any enrollment discounts you do not wish to copy. Enrollment discounts can be adjusted here as well. By default, the divisions and bunks from your current year's bunking boards will be copied to the following year. This will only copy the bunking board for the sessions you selected above. You can choose to un-check this option if you do not wish to copy divisions and bunks. By default, Staff Departments and Titles from your current year will be copied to the following year. You can choose to un-check this option if you do not wish to copy staff departments and titles. By default, all yearly forms and session forms (for the sessions you have chosen to copy above) from your current year will be selected for copying. If you do not wish to copy a specific type of form, un-check it. By default, immunization records for Campers and Staff will be selected for copying. You may un-check this box if you do not wish to copy immunization records. This information will be editable on the Parent and Staff Dashboards the following year. By default, session groups and buses for the sessions you selected will be copied to the following year. If you do not wish to copy transportation methods and buses, un-check it. When transportation is copied, the session groups will automatically revert to being "inactive" for the new year. Transportation transactions will need to be re-created, if applicable, and the form re-activated in order to be available to families through the Parent Dashboard. By default, Program Segments from your current year will be copied for each session selected above, if you are using the Program Module. Note: Copying Program Segments will not copy Cycles within a Segment. By default, the statuses of campers enrolled, or staff hired for, your current year will be set to "Pending" to the following year. Other statuses will retain the same value as the previous year. 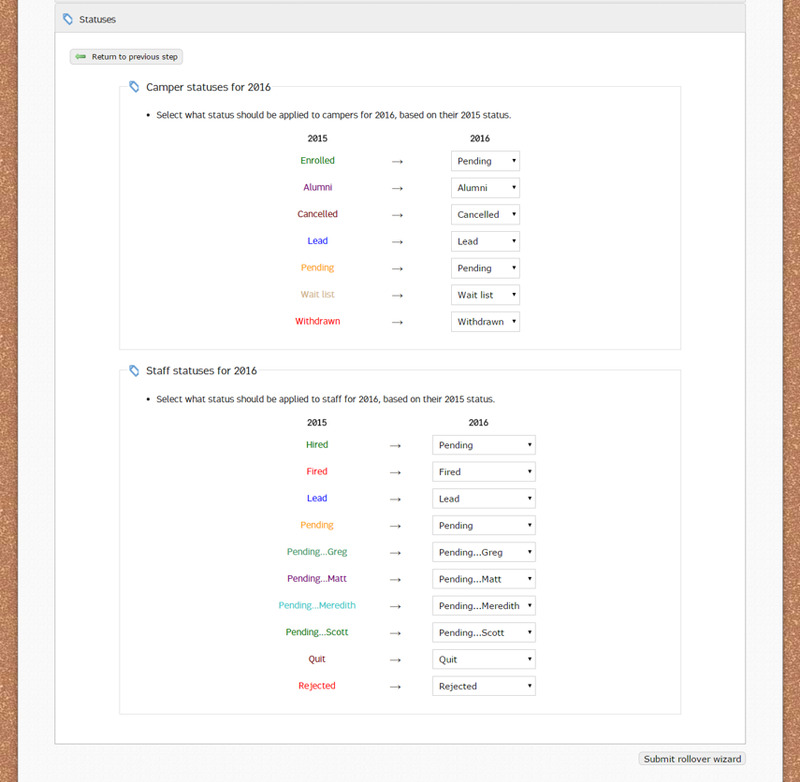 Use the dropdowns to change the statuses if necessary. When you have reviewed and updated the information you are copying, click "Submit rollover wizard". This will allow you to begin enrollment and hiring for 2016. Submitting the Rollover Wizard will not change your current year in CampSite until you complete Step 2. You should review enrollment form text, staff application text, canned letters, saved e-mails and staff contracts and update information as needed for the following year.